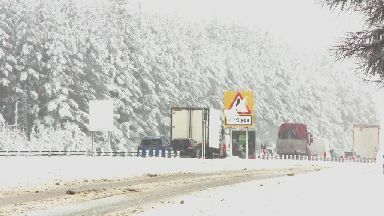 The A9 was closed in both directions on Wednesday morning as heavy snow fell. Police closed the Perth-Inverness road at Slochd around 7.30am and urged motorists to avoid the area. It reopened around four hours later. Part of the A85 was closed for a spell in Crieff, Perthshire, after a tree fell and blocked the road. Kingussie High School was closed as buses were unable to get pupils there safely. Snow was also falling in parts of the Lothians and Fife on Wednesday morning. 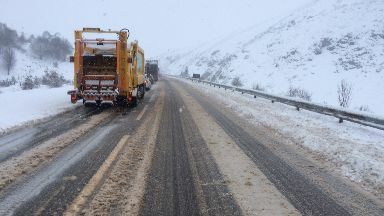 The bad weather also forced the closure of snow gates at both ends on the A957 Cairn O'Mount Road between Banchory and Fettercairn. Police said: "At this stage it is unknown when the road will be re-opened. The public are advised to avoid the area and seek an alternative route." Meanwhile, the Met Office issued a severe weather warning for the south of Scotland, with persistent snow and rain on high ground expected. The warning was in place until 10am on Wednesday morning.